The first phase of Mercedes' service in the United States enables speech-activated assistants such as Google's. "We are doing this because we want to reduce driver distraction." The Google Home and Amazon Alexa integration recently announced by Mercedes-Benz in the Untied States is not yet available on Canadian models. But, Mercedes-Benz Canada tells Automotive News Canada that the new connected-car technology is being developed for Canadian models. “The launch date is not confirmed for the technology,” spokeswoman Sinead Brown said in an email. Mercedes-Benz Canada didn’t provide any more details. Mercedes is launching the service in the United States first because adoption rates of in-home digital assistants are high there, Schanz said. The company plans to introduce the service in Europe this year and is working on solutions for Asia, said Nils Schanz, head of Internet of Things and wearable integration at Mercedes-Benz Research & Development North America Inc. Phase one of the U.S. rollout started in late April. In the United States, owners of 2016 and 2017 Mercedes-Benz models can now ask Google's or Amazon's in-home digital assistants to help them handle car-related tasks -- for instance, lock their vehicle remotely or look up a coffee shop address and send it to a vehicle's navigation system. Longer term, Mercedes owners will be able to use a Mercedes-created digital assistant inside the car, though company researchers are still figuring out what should be controlled by in-car voice commands and how long it will take to add such a feature. "We are interested in these new assistants [because] they are based on artificial intelligence and they become better and better over time and they learn," Schanz said. "We believe that speech -- the whole voice recognition with natural language understanding technology -- will become more and more important." Mercedes joins a range of automakers integrating with speech-activated assistants. At the CES technology expo in January, four automakers -- Ford, Volkswagen, Nissan and BMW -- talked about plans to use assistants such as Amazon's Alexa with their vehicles. Mercedes launched phase one of its new service in late April by enabling the use of the Amazon and Google assistants. Mercedes customers who own the devices need only to download the Google Home or Amazon Alexa apps and connect their Mercedes Me accounts. Mercedes Me is a package of services and products from Mercedes that also offers vehicle owners access to their cars via a smartphone app. In addition to locking vehicles or sending navigation info, users can activate other functions using natural speech commands. For instance, customers can say, "OK, Google, tell Mercedes Me to start my car," and the car will remotely start. Phase two comes this year and adds functions, Schanz said. They aren't finalized but could include expanded trip-planning guidance such as routes to charging stations for electric vehicles or customer assistance to explain a vehicle safety feature. Another option under consideration is coordination with the owner's electronic calendar to generate in-car reminders. For instance, Schanz said, an owner could say, "Alexa, remind me tomorrow when I'm driving home to buy flowers for my wife's birthday." On the next day's drive, a reminder window could pop up on the infotainment screen, or a voice prompt could be generated. 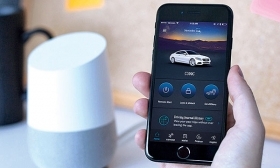 In addition to integrating with digital assistants, Mercedes by the end of May also will take its next step in integrating with home automation services such as those offered by Nest, Schanz said. That will allow a driver to set a home's lights to come on, a garage door to open automatically or a home's temperature setting to be increased when the car crosses a geo-fence position. Owners of about 90 per cent of the brand's 2016 and 2017 models will be able to add that functionality, he said. Eventually drivers will be able to give natural voice commands from inside their cars to Mercedes' own digital assistant, Schanz said. A timetable and name for the Mercedes assistant haven't been finalized. While it won't make sense to control everything by voice, he said, the industry is going in the direction of assistants. Making driving easier and safer is the key, he said, whether asking the assistant to operate a vehicle function such as closing the sunroof or to update a calendar item. "We are doing this because we want to reduce driver distraction," Schanz said. "So we're saying it's better for our customers to use the voice system in the car." Amy Wilson, Katie Burke and Greg Layson contributed to this report.